This is the 3rd question in the bloghop series for the #ossemooc on-line book study of George Couros’ book The #innovatorsmindset. Chapter 7, which marks the end of the second section of the book, ends with a series of “What if…?” questions. As you can tell from the highlights in the above image, I’ve been thinking more about some of these questions than others. The risk-taking question is one that I’m particularly interested in, and often, frustrated by. I know risk-taking is a huge piece of the puzzle for any learner. I also know it’s an extremely difficult one for me. I’m a gifted student who always played “school” very well, but who shied away from anything that I couldn’t do right the first time. It took the patient coaching of my spouse (also a gifted learner, but one who has always been much more open to learning experientially than I am) to convince me, in my 20’s, that it was okay to not be really good at something the first time, and to allow myself to “risk” in order to gain a new skill. Now, I sometimes see that stance of fear reflected in both my students and my own kids. I try really hard to model my “risking” behaviours and talk about my learning process, at least partly because I’d like to save them the grief and missed opportunities my fear caused me. I see the fear of failure coming from two very different places with my students – those who don’t want to risk because they’ve tried before and the existing school system has made them feel like they can’t succeed; and those who don’t want to risk because they’re afraid of what will happen if they don’t succeed, because that’s not a place they’re willing to go, or have experience with. I’m realizing that my colleagues are probably coming from very similar places, and if we are going to move forward at all, we have to both be willing to name that fear, and address it. Creating an environment in which people feel safe to do that takes us back, as Leigh said in last week’s hangout, to “relationships, relationships, relationships”. 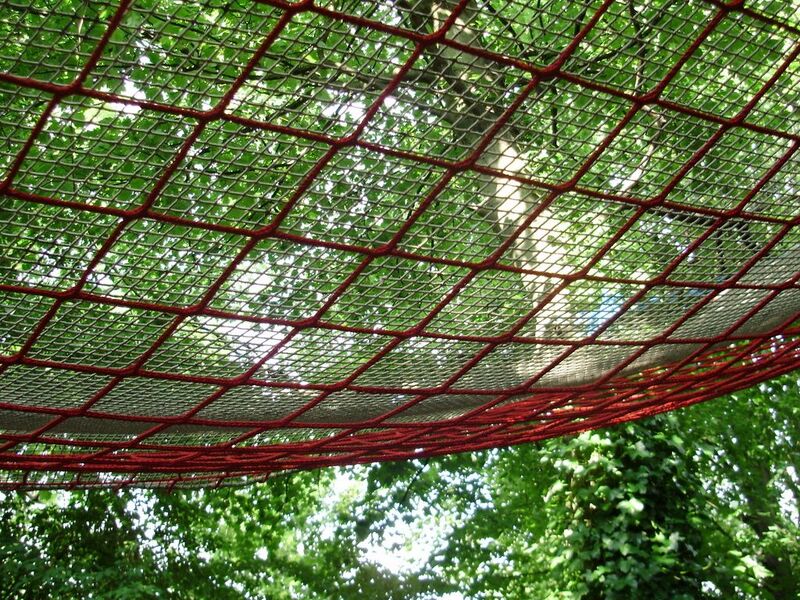 Without taking that first risk to trust each other in our professional context, the safety net won’t hold. How we build that net with the diversity of learners and experiences in our school communities is still one of my biggest questions. My other “what ifs”?Those tend to be aimed more inward than outward, and I offer them for your reflection. What if I just stopped making excuses for why I haven’t tried an activity I think looks interesting, and just did it? What’s the worst case scenario? And of course, what if we were easier on ourselves when things didn’t go as wonderfully as we thought they would, and what if we were better about sharing those experiences with our peers – the plateau and the ravine, as well as the mountaintop? How might that change the discussion? 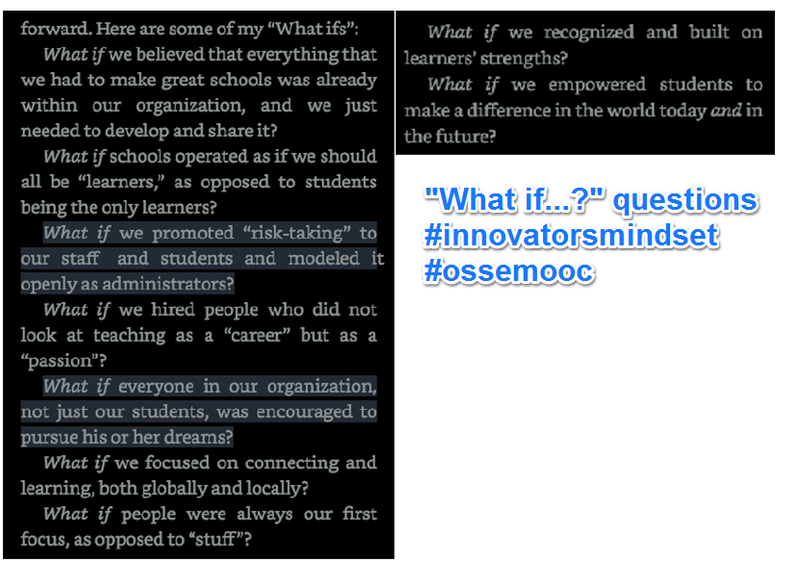 This entry was posted in Education, Uncategorized and tagged #innovatorsmindset, bloghop, ossemooc, risk taking, trust, what if. Bookmark the permalink.